“When I told my friends I might go to China for my undergraduate studies, they thought I was crazy,” says Defne Inhan ‘18, from Turkey. But after studying abroad during high school, she knew she wanted to study in an international environment. 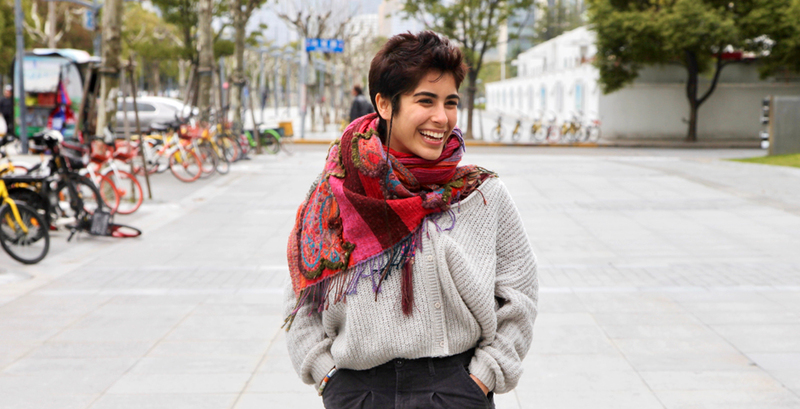 After experiencing Admitted Students Weekend, she realized NYU Shanghai would be the perfect setting to pursue her passion for what became her major--neuroscience and psychology, her minor. Inhan took advantage of the opportunities to study away in New York and Ghana to further explore her field and discover her interests. She began contemplating whether she wanted to pursue research, become a scientist, or incorporate movement-based art therapy into a career. In the spring semester of her junior year, Inhan decided to discover more of the arts by studying away for a third semester, this time in Accra. During her semester in Accra, Inhan befriended local Ghanaians and learned how to play the separawa, an archaic instrument of Ghana that was remembered back into existence from a man’s dream and taught to her by the dreamer’s grandson. As for after-graduation plans, Inhan has been inspired to either pursue a masters in developmental neuroscience and psychoanalysis or a research internship in New York.